It may be difficult to think spring with snow on the ground but this is the perfect time to start your garden. It is best to start growing your seeds indoors about 6-8 week before the last frost, which in Maine is usually the last week of May. 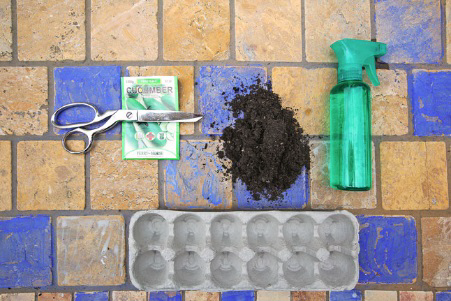 Starting seeds indoors will give you a head start on your garden. It will allow more time to grow your plants which means more fresh fruits and vegetables through the season. Plants that are started indoors early have a better chance of surviving outside once transplanted. If you are worried about having too many plants or not using all the seeds in a package you can share with family, friends or neighbors. Also, you don’t need a lot of space to have a home garden. When transplanting seedlings, they can go into the ground or into a large pot to add color and decoration to your porch or yard. It allows for time outside and keeps everyone moving. In this issue, we will share an overview of the responses from the “Service Information” section of the 2017 Partner Agency Survey Results. If you missed the last issue with the introduction and “Getting to Know You and Your Program” section of the survey, no need to worry. You can get caught up here! The “Service Information” section is filled with a wealth of valuable information. To be sure we have covered it all, you will find part II of this section in the Summer 2018 issue of our newsletter. Stay tuned! Almost a quarter reported being open once a week. Another 18% of agencies reported being open 2 to 3 times per week. 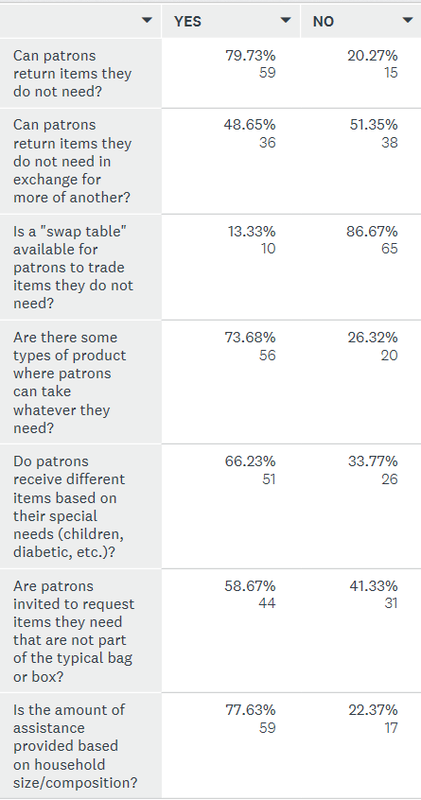 Of the survey respondents, 38% said patrons can access their services once per month, while 21% of respondents said patrons can come as often as they are open. 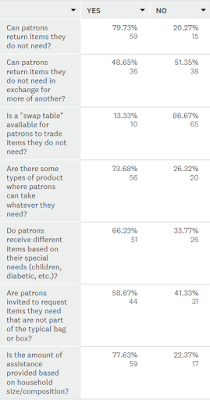 Many respondents indicated “other” and said in addition to monthly staples, patrons can also come weekly for a produce distribution or that they are available as needed for patrons. The winter and fall seasons are the busiest for our partners with November through January being the busiest. Three quarters of the agencies are able to track unduplicated services or their numbers are naturally unduplicated. Survey respondents reported on frequency of after-hours requests for food. 33% receive requests once per month or less and 29% said they receive requests 2 to 3 times per month. The majority of after-hours requests come in on the weekends. More than half of agencies who responded to this survey offer a client choice model. Another 17% offer their patrons a “virtual choice” with a menu to choose from. The majority of agencies who offer pre-boxed or pre-bagged items also offer some types of products where patrons can take as much as they need. Two thirds of agencies tailor boxes to household needs based on children, dietary restrictions, etc. and more than half invite patrons to request items they do not typically receive in their pre-packed box or bag. Is Your Program Listed on 2-1-1? 211 is a free, confidential information and referral service that connects people of all ages across Maine to local services. 211 Maine is available 24 hours a day, seven days a week, by phone (just dial 211 to connect), text, email, and searchable online database. Making certain that your food pantry, meal site, or shelter information is available on 211, and that it stays updated, is a great way to ensure people can find your program and the services you offer. It is also a great resources for connecting your patrons to the other services they may need, such as clothing, housing, and transportation. You can go to https://211maine.org/ to verify that your program is listed in their directory. If you are interested in adding your organization to the resource directory, you can contact the Resource Department at (207)221-8150 or if you prefer to do it online, you can complete the form on this page. To make changes or updates to existing listings, please contact Mary Jo, Resource Coordinator at (201)221-8160.